J ust back from shoveling eight inches of snow from my driveway (in Charlotte, NC), I am reminded that things don’t always go as planned. Actually, my 16 year old son did most of the work, while I gave constructive advice (I AM the Editor, after all) based on years of experi- ence enduring much worse than this while growing up in Massachusetts. That dialogue might be slightly off topic but then again, maybe not. And, maybe I did do a little bit of planning, after all. The driveway got shoveled, didn’t it? 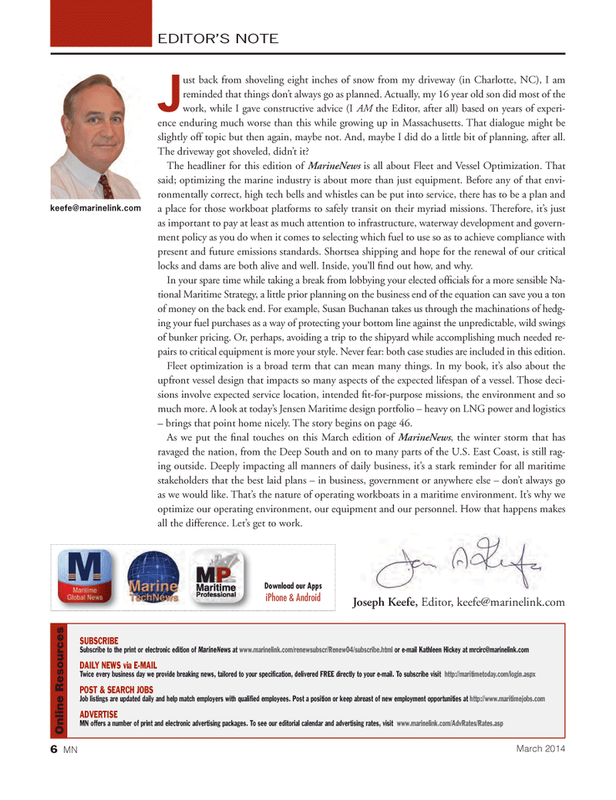 The headliner for this edition of MarineNews is all about Fleet and Vessel Optimization. That said; optimizing the marine industry is about more than just equipment. Before any of that envi- ronmentally correct, high tech bells and whistles can be put into service, there has to be a plan and a place for those workboat platforms to safely transit on their myriad missions. Therefore, it’s just as important to pay at least as much attention to infrastructure, waterway development and govern- ment policy as you do when it comes to selecting which fuel to use so as to achieve compliance with present and future emissions standards. Shortsea shipping and hope for the renewal of our critical locks and dams are both alive and well. Inside, you’ll fi nd out how, and why. In your spare time while taking a break from lobbying your elected offi cials for a more sensible Na- tional Maritime Strategy, a little prior planning on the business end of the equation can save you a ton of money on the back end. For example, Susan Buchanan takes us through the machinations of hedg- ing your fuel purchases as a way of protecting your bottom line against the unpredictable, wild swings of bunker pricing. Or, perhaps, avoiding a trip to the shipyard while accomplishing much needed re- pairs to critical equipment is more your style. Never fear: both case studies are included in this edition. Fleet optimization is a broad term that can mean many things. In my book, it’s also about the upfront vessel design that impacts so many aspects of the expected lifespan of a vessel. Those deci- sions involve expected service location, intended fi t-for-purpose missions, the environment and so much more. A look at today’s Jensen Maritime design portfolio – heavy on LNG power and logistics – brings that point home nicely. The story begins on page 46.